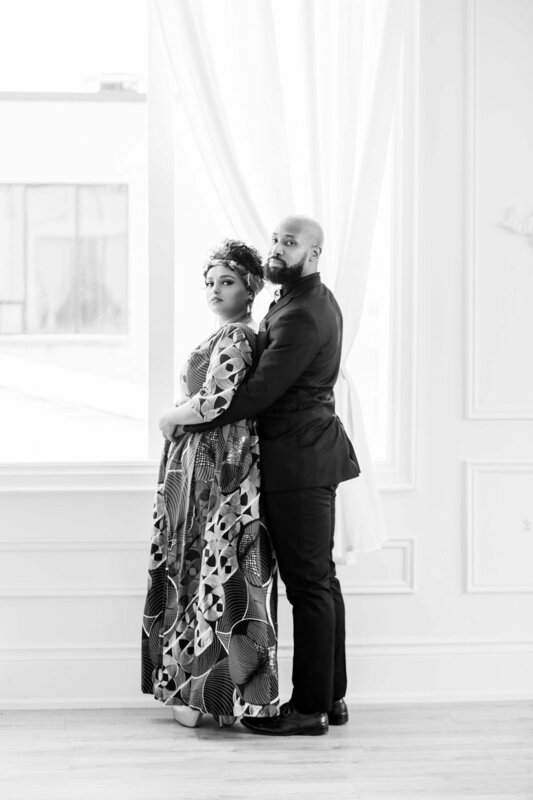 Rania and Ekow's Engagement Shoot at Mint Room Studios! Salut Everyone! It has been a while but this week I am happy to share images from this most stunning e-shoot that I got to do at a really lovely location back in January! 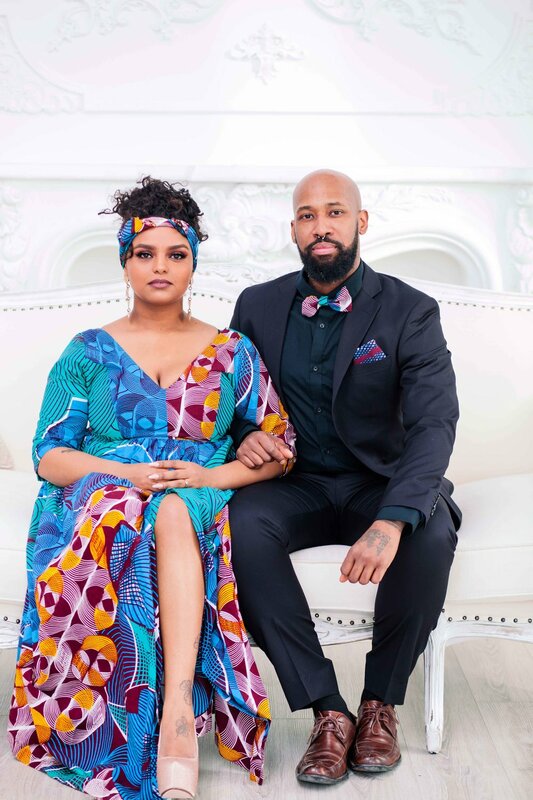 The week that I did this engagement shoot turned out to be one of the coldest weeks in Toronto's history, so even though we initally had plans to do this shoot outdoors, we were not about to freeze out in the frigid weather. My clients Rania and Ekow requested I suggest an indoor location and so I suggested the beautiful Mint Room Studios! I had heard about Mint Room Studios on a photography group on facebook and thought it might be cool to try out. I have to say I am already totally in love with this studio and you will know why once you see the photos! We had the "Ballroom Studio" booked for this shoot (one of their 4 studios) and I was pleasantly surprised to see that there was so much natural light coming into the room though the large windows. I can now say that it has easily become one of my favourite studios ever! 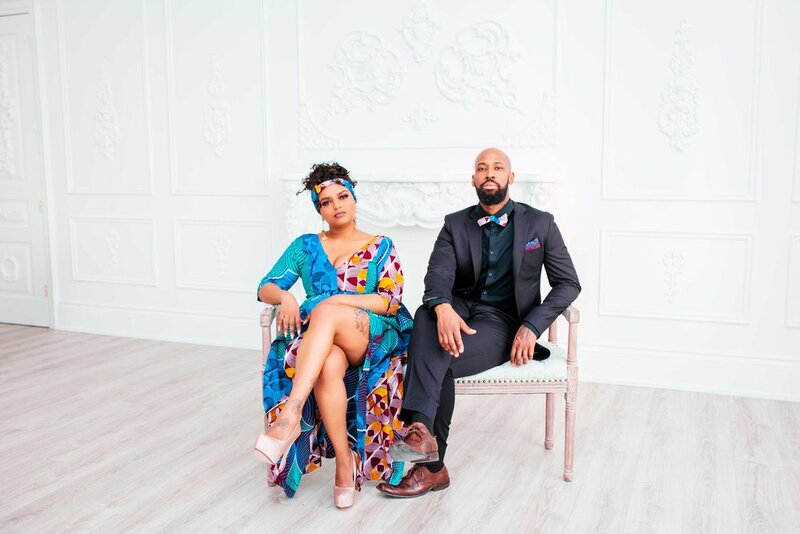 It was a pleasure to work with these two for their e-shoot and I absolutely love how they coordinated amongst themselves with the African Print dress and accessories. Also the engagement ring Rania was rocking is my oh my just "out of the ordinary" stunning! Rania's headtie, Ekow's Bowtie and pocketsquare: All made by talented Rania herself! If you would like to book me for your 2018 engagement photos then get in touch HERE! Okay so that bring me to the end of this blog post! If you are getting married soon and are looking for an engagement photographer then do get in touch! Until next time, A bientot! If you would like to book me for your 2018 enagagement photos then get in touch HERE! Hey Everyone! Glad to have you here! I am uber excited about today's blog post! I can only share details due to client privacy but I just absolutely love how much thought was put into the little details at this wedding. Everything from the bride's dress to the sweet table at the reception was amazing! I also think I am now in love with "Blush Pink" as a wedding colour. A little backstory; the bride was one of the first people to give me a chance when I was first starting out with wedding photography by booking me for her friend's wedding a few years back. It was nice to come full circle and capture her wedding this time around MashAllah. Enjoy the blog post! On a side note I am currently booking 2017 weddings at 2016 rates up until January 1st 2017! Fill out the contact form on the contact page to get access to the client lounge where you will find my pricing and FAQs as well as vendor info.